This is the expected amount of jobs created by RE sector come 2020. In 2010, The Star cited experts estimation of creation of at least 52,000 jobs from the construction, operation and maintenance of renewable energy plants in the country by 2020. Earlier this month, New Straits Times carried an article stating a more conservative figure by economist, estimating 50,000 jobs created by RE plants. If we are to spread this over the course of 9 years, that would be about 5,000 to 6,000 jobs created every year; a very interesting prospect for an emerging economy. This is very much possible. The RE sector is fast gaining ground as a new growth area for many countries with the potential it presents environmentally and economically. It plays a major role in meeting energy needs, making it possible for businesses to reap energy cost savings while combating global warming. 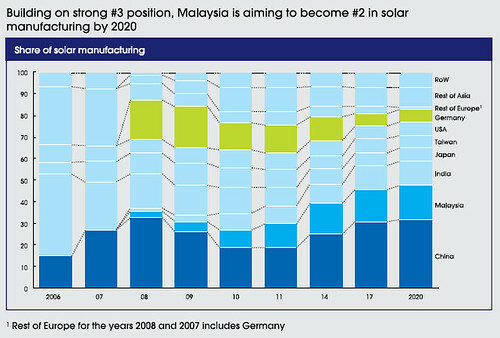 Currently, Malaysia is world 3rd largest producer of solar cells after China and Germany. Malaysia already already have companies across the entire value chain, from silicon production to solar cell manufacturing and module assembly. Source: Ministry of Information Communications and Culture, Malaysia. With the committed amount of fund for the rolling out of the first FiT incentive for 2012 - 2014, Malaysia is on the right direction to achieve a targeted revenue of at least RM70 billion from the private sector by 2020. What does this means to us? That means more new talents and skills, especially in RE sector, would be needed so much sooner than later. We do not want to go into an industry we have less talent of and end up hiring people from other countries to do things for us. The targeted quantity must be matched with the right quality of our human capital. It is an opportunity for us to learn new technology, to perfect an existing method to be efficient and be the largest producer of solar related products. @Wak Gelas. I harap itu langkah terakhir setelah semua kaedah lain sdh di explored. @gadisBunga. Memang sesuai & mengikut kajian, Pulau Pinang dan Sabah mpunyai jangkamasa sinaran matahari paling optimum utk pepasangan solar modules. Creating jobs for us are good, but do our community grateful about it? I'm sorry but I'm skeptical about the number. :) Only certain parties are serious about RE, I think. @KY Chua. On the other hand, certain 'parties' seem to have an upper hand on getting the incentives (read Feed-in-Tariff) kicked start by the government this month. The RE quota for the first 3 years snapped within the first hours by them, leaving other non-individual applicant puzzled. @Meitzeu. They (and all of us)should be grateful & seize the opportunities if they come our way, no? What's Better for you: Well-Done or Rare steak? Tablet PC the way to Go?